TL;DR: On April 21, Google is rolling out a BIG update that affects how they rank mobile sites. Since over half of internet traffic is mobile, this has a huge effect on your website’s search presence. It’s been quiet for a while on the major search engine algorithm upgrade front. But leave it to Google to shake things up every once in a while to keep search engine ranking techniques interesting. Due to the massive increase in mobile traffic, as well as the varied needs of users on differently-sized tablets, smartphones, and other devices, Google is going to update their search algorithm to reward sites that can adequately meet the needs of this technologically-diverse environment. It means if your site isn’t mobile ready, you’re in for a hit. Fortunately, Google’s Gary Illyes is giving site owners and marketers enough time to prepare… or at least know what kinds of disruptions to expect. If this is like the previous Google updates, a lot of small business owners who hired the wrong SEO firms are going to be unhappy on April 21st. The good news? I’m going to cover the Google update in my next TL;DR Report. 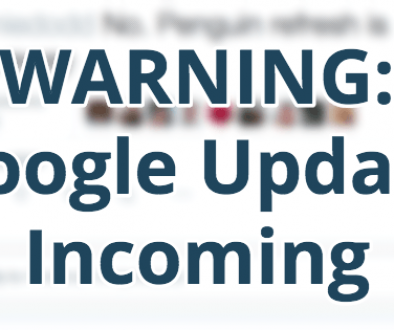 It’s impossible to know exactly how a new search engine update will affect your business. But if you follow the insider information I’ll include in the next issue, the updates on April 21st won’t wreck your business come April 22nd. Subscriptions opening soon. Keep checking this blog for more information.